I love Laurel and Hardy. I’m not sure how many of their features I’ve seen. I do fondly recall watching their shorts on weekends growing up. However, that and the fact that The Music Box became a sort of white whale for me for years does factor in. 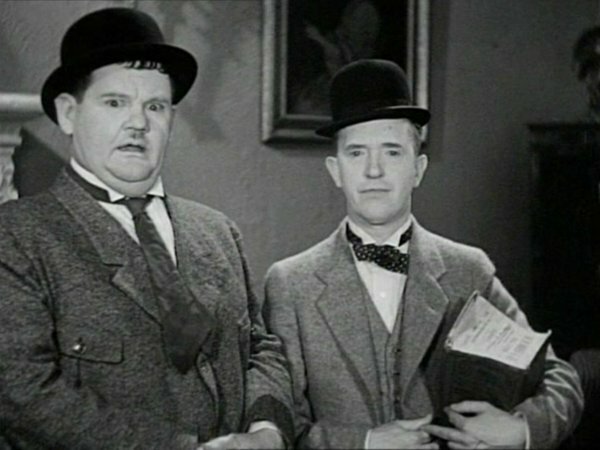 The fact that Laurel and Hardy was just something I found on TV, usually thanks to TCM, lead to me seeing many of their shorts without knowing their names. The internet, my studying films, and revisiting some had men eventually find The Music Box by title. In my youth I knew them as O Gordo e o Magro first, the Portuguese name for the pair which translates to The Fat Man and The Thin Man. I learned their names in English, and watched them here, I even recall coming across plastic toys of them in Brazil. That dyed-in-the-wool fandom has me wandering back to them on occasion as my gyre of movie-watching wends its way through history, be it their silent, more often their short talkies or their features I come back to this duo often. his creative pioneering in the field of cinema comedy. Stan Laurel was not present at the awards ceremony. Presenter Danny Kaye accepted the award on his behalf. 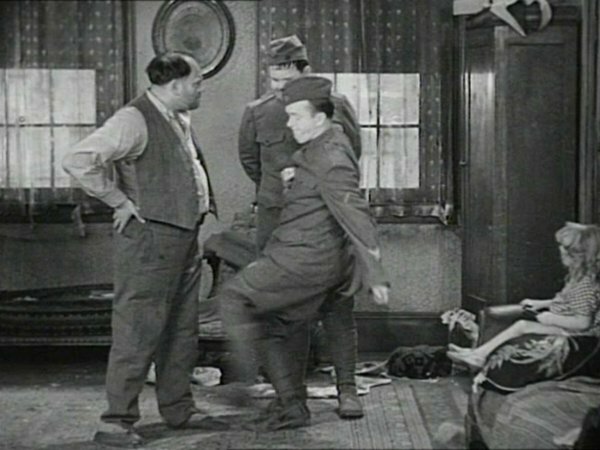 When trying to select a way for me to discuss the War to End All Wars on Film Laurel and Hardy were the only way I could find to get myself a comfortable toehold. A silent, solo turn by Ollie in The Show, and their film Brats was one of my favorite discoveries of 2012, were two other times they came up just on my blog. So, you can clearly see an omnipresence there in my life and times. However, the most persistent memory of them of all so far as I’m concerned is The Music Box. It’s one I may have lost track of for a time because I think of it the way Friends names episodes “The One with the Piano Movers.” This is likely their most iconic bit. It’s not a wonder the synopsis cites Sisyphus because the task at hand is just as hopeless and fraught with peril but far funnier with these two involved. Humor is subjective, but since I saw it this has been one of the handful of funniest things I’ve ever seen. Enjoy! When trying to decide what film to cover for the World War I Blogathon I wasn’t surprised either by the number of films, or by the number of films I have yet to see. The reason that is so is that there are things about World War I that make it, to an extent, less conducive to cinematic representation than other artforms. The complexities of the causality of World War I as well as the carnage make it such that there are not as many treatments of it on celluloid. Clearly, World War II was rife with atrocity and death, but the sides and aims were far more clear there. It makes archetypal depictions, and now an exploration of gray areas, far easier. The Movies, Silently comparison of the war to a barroom brawl is a good one; for further detail you could look at it as an inevitable endgame of the last era of imperial expansion and over-zealous treaty-drafting. It puts it into understandable context and shows what unbridled chaos existed. Such chaos on film is better as a detailed snapshot rather than an overview, in novels more detail could be explored. Therefore, films typically focus on the fighters not the fight because it’s just too much obfuscated politics for audiences, then or now, to care about. So with all that in mind I started looking through options as the few titles I’d seen were taken. 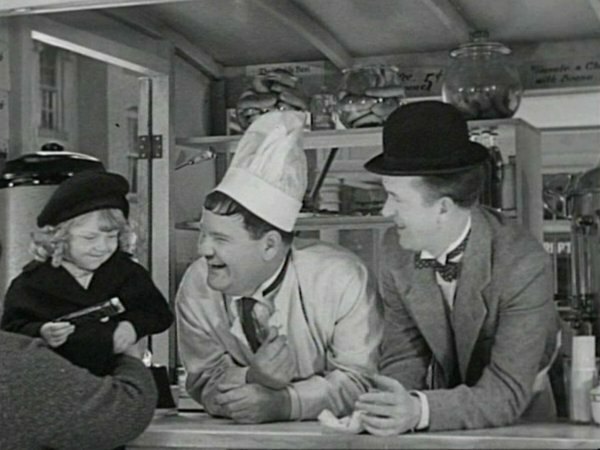 There were other new-to-me options that were taken but I settled on Pack up Your Troubles starring Laurel and Hardy. It’s interesting also to pick a comedy because the fallout from World War I included the birth of existentialism and change in the kinds of entertainment people wanted, at least for a time. During, and especially after the war, silent cinema came of age. Subject matters became more serious and features became predominant. However, this feature coming at the start of the Golden Age, and sound, escapism was coming back. Interestingly the film in question here is one that was made in 1932 the very year in which Adolf Hitler became chancellor of Germany and events would unfold leading to World War II. But enough history, well strictly history, let’s get into the film. Now to the present-day audience the title itself was an allusion to the Great War and a hint as to what the adventures of Laurel and Hardy may entail. Pack Up Your Troubles references a war time tune that you can hear here. What my precise viewing filmography with Laurel and Hardy is remains uncertain because I remember as I was growing up there was a time I’d find their films on TV on Saturday mornings (Probably on TCM) and watch them, sometimes from the middle, and not have any notion of what the title was. I cannot even recall how many of these titles were features. I did see one of their features for 31 Days of Oscar not too long ago and really enjoyed it. As for Pack Up Your Troubles it starts out similar to their other titles. The war has started and and Ollie is looking to get out of service by claiming disability. As expected, Stan blows their cover without meaning to and they’re off to basic training and eventually the trenches. There are some slapstick scenarios built-in that are moderately funny, but not among their best. This is without even taking into account the fact that jokes in a war film can only be so funny due to the cacophonous nature of battle and the lives at stake, see 1941 as an example. To this film’s credit, despite the fact that it’s not that great, it realizes there’s only so much to do there and the thrust of the film has a heartwarming element where they’re trying to unite a little girl (Jacquie Lynn) with her grandparents after their friend, Eddie (Donald Dillaway), dies in battle. In essence, it’s a bit like Ollie and Stan’s version of The Kid, except true to their character they will not keep the kid, but do want to do right by her. What this creates for the remainder of the hour-long tale is quite a few skits where they are looking for a Smith family and finding the wrong one. There is, of course, follow-through and a central plot, but it’s a narrative structure that allows the pair of foils to play in a milieu that is not unfamiliar to them in the least. Having said that with the stakes being raised, and somewhat serious, and with the gags being not as frequent or as memorable as in many of their other titles it makes it a bit of a tepid affair. While the war itself is left by the wayside in the story the effects, and collateral damage does follow into peacetime just as it did in reality so that much is fine and works effectively. The resolution the film reaches is also very satisfactory, funny and well handled despite its convenience. In fashion not dissimilar to World War II it seems there was an “We all have to pitch in” and tell a tale dealing with the War to End All Wars. Laurel and Hardy weren’t the only renowned comedians to handle it. If you know them they bring the film to a conclusion you’d expect. It’s mild escapist fare, but certainly not the best evidence of their comedic genius as a tandem. In fact, the film probably works best as a humorous fable of the reconstituting of families after the war that occurred the world over.